Rugen is the silliest cat. He is terrified of the most ridiculous things – this time it’s a plastic bag. Actually, it’s just the plastic slider thingy on a zipper bag. He’s been skulking around it, working up the nerve to approach it. He stretches his body out as far as he can – tail pointed, lanky body elongated, neck in full giraffe mode. One paw extends cautiously, then WHAM! he smacks it it and retreats to see if it will fight back. When there’s no response, he slinks back to it and tries again. When he hits it hard enough to make it fly into the air, so does he. 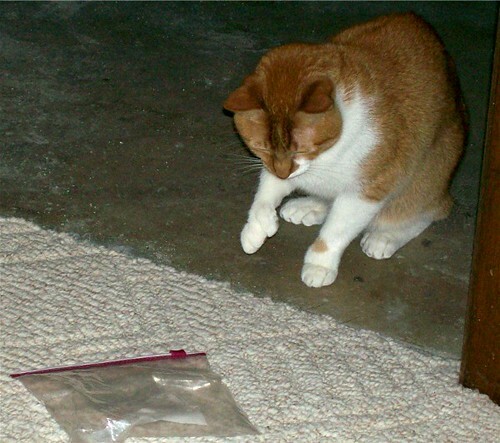 Unfortunately, I wasn’t able to capture any action shots, but here he is checking out the bag.